Welcome everyone, to the Naruto X Boruto Ninja Voltage Tips and Tricks guide. This guide is designed to help you understand the mechanics of the game and give a few tips to help further yourself. 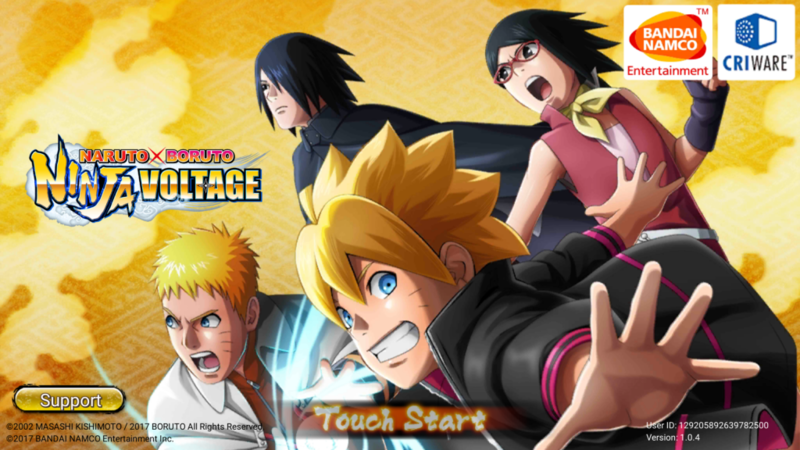 Naruto X Boruto Ninja Voltage is a mobile game based on the popular anime and manga series Naruto. 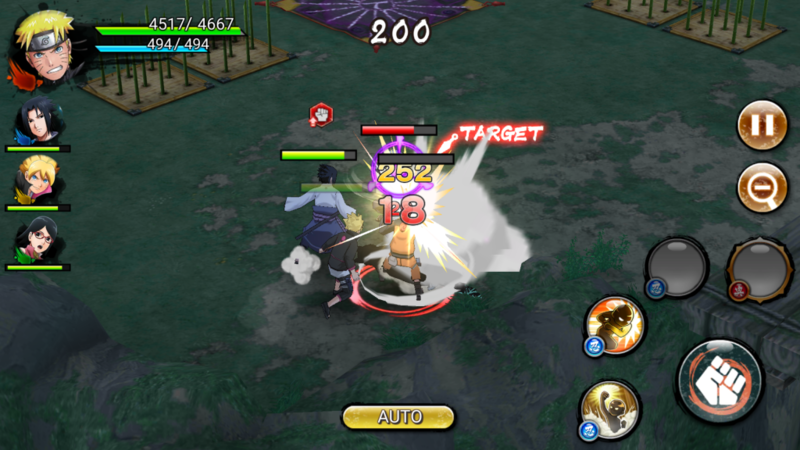 In Ninja Voltage, you can build your own team of Naruto characters and take them out on missions. Ninja Voltage is set up in Action Role Play style of games like Marvel’s Future Fight and Bleach: Brave Souls. You make a team of characters then take them on a mission where you run around and attack hordes of enemies until you reach a boss. The controls are fairly simple and easy to get the hang of. On the left side of the screen, you have your touch screen analog stick which lets you move around. On the right side, you have your attack commands you can do. Your normal attack, then up to 3 Jutsu and an Ultimate attack. The presentation of the game’s controls is simple and easy for anyone to understand. And for anyone who’s played similar games, you’ll be feeling like a pro at the very beginning. In missions, there are a few things you have to watch out for aside from enemies hordes and the mission boss. These mechanics are explained well in the tutorial so be sure to pay attention during that. In every mission, there are barrier fields where enemies will spawn. Defeat the enemy and the field is destroyed and you can move on to the next part of the stage. There will also be defense systems you can destroy and sometimes mini-bosses, like Orochimaru’s Manda in the tutorial stage. So there’s some depth and difference to Ninja Voltage compared to other games of the genre. 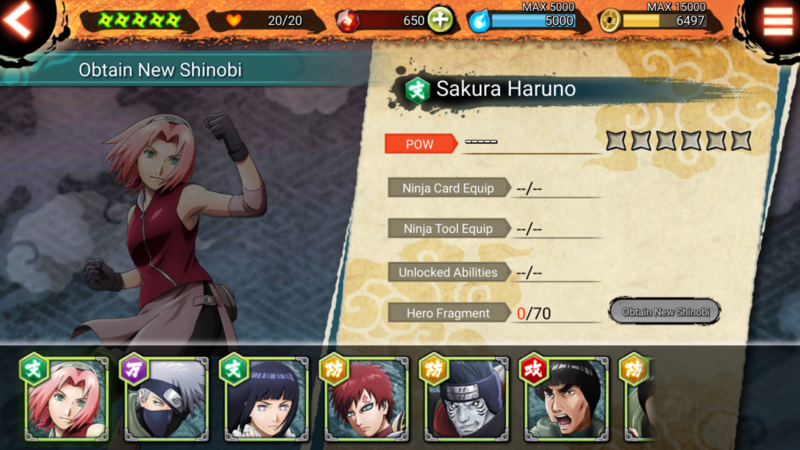 The big and obvious pull to this game is being able to create your own team of popular Naruto characters. But you only start off with a few basic characters. In order to unlock more, you have to play the game to unlock missions. In missions, you can get character fragments and these are used to unlock characters who are designated in the fragment. Collecting hero fragments are your way of expanding your roster. And it’s a good incentive to go back and play missions more than once. Once you’ve unlocked some ninja another mechanic comes into play that’s possibly more important than collecting the characters themselves. While characters are obtained through hero fragments, there is a summon system for another important collectible. 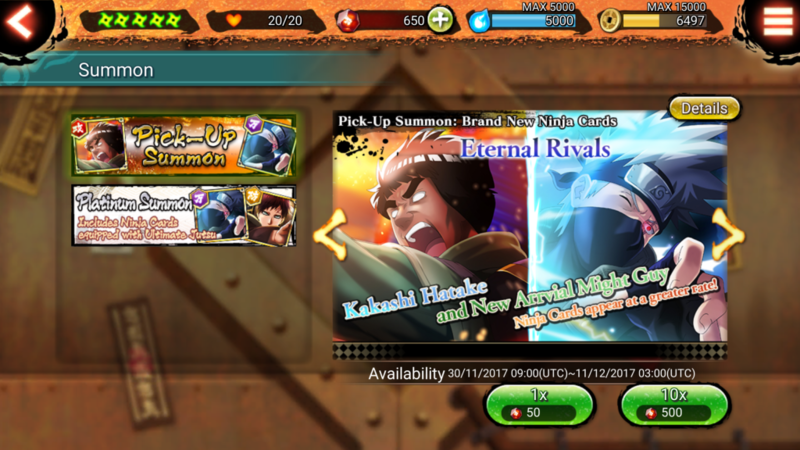 Ninja Voltage has a summon system where you pay the in-game currency to buy summons for Ninja Cards. These cards are special equipment you can put on your characters. The cards offer a wide variety of bonuses from stat boosts to actually different attacks for your characters. The card pulls can be done with in-game currency which can be bought with real money. Ninja Cards are very important to the overall momentum of the game. In the early stages, their importance isn’t extreme but as you progress you’ll need to have some characters outfitted with some Ninja Cards to really get ahead. 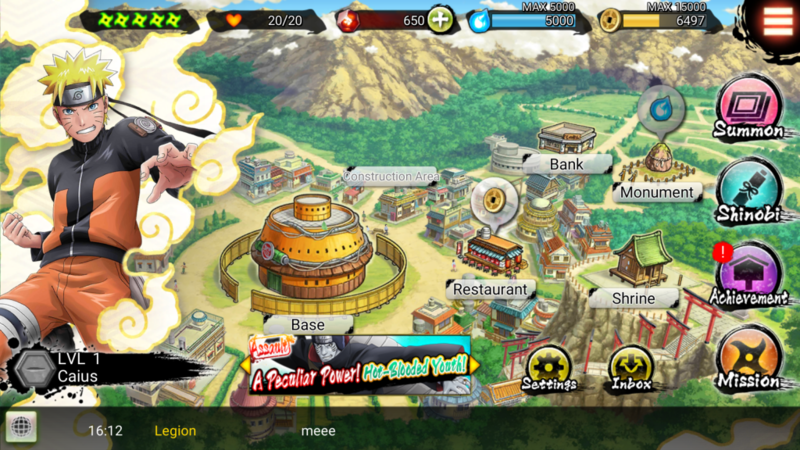 In the main screen of the game, you have your village that you’re the leader of. This is the screen where you navigate to other functions of the game. But aside from going to other game modes, there are some things you can do on the main screen that is actually rather helpful. In your village, you have some buildings you’re able to interact with. Your Momument generates chakra which you can collect. Chakra is a valuable resource in Ninja Voltage because it can be used to upgrade buildings and some other payment mechanics in place of shinobite, the in-game currency. The restaurant is similar in the way that it gives you Ryo, another currency in the game. Ryo is also used to upgrade certain buildings and the amount you can get can be upgraded at the Bank. These little upgrades are subtle but helpful in the long run. You’ll gain Chakra and Ryo as the game goes on and be able to use them with little issue. The biggest tip I can give to Ninja Voltage, be patient during missions. 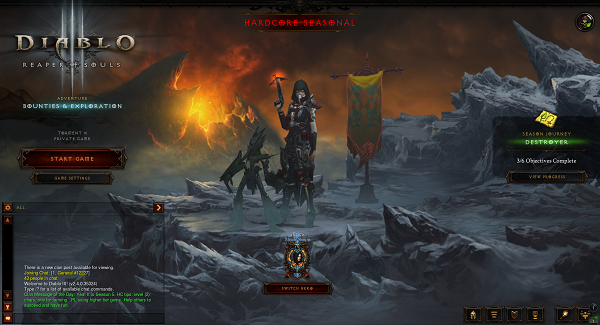 When playing missions it’s easy to just run and gun the mobs and bosses in the early stages. There really isn’t much to it other than tapping the normal attack and bashing your way through enemies. But once you start reaching more difficult stages that method will become less viable. In Ninja Voltage there are no invincibility frames like there are in most action mobile games. Normally if your character is knocked down or an enemy is knocked down they can’t be targeted or damaged until they’ve gotten up. But in Ninja Voltage both character and enemy can still be attacked while on the ground. This is a slight mechanic that can be taken advantage of when used right but also be highly dangerous to the player. If you run through randomly attacking everything chances are you’re gonna get knocked down. If you’re surrounded by a group then you’re gonna take some definite damage, even worse if you’re fighting a boss. 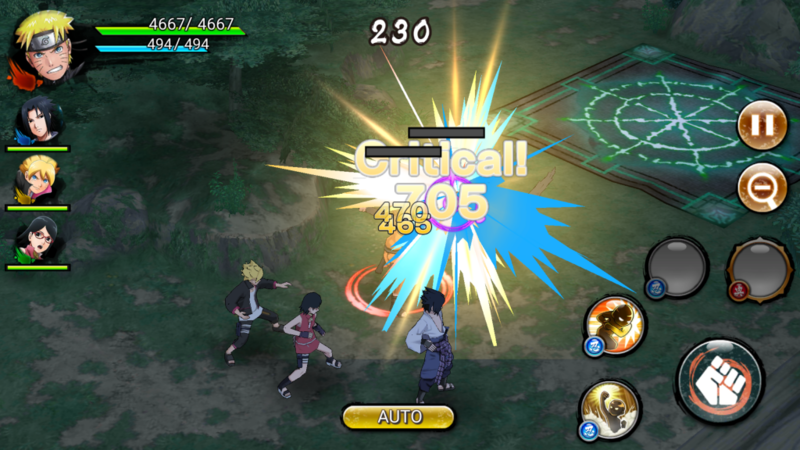 By timing your attacks and jutsu you can get enemies knocked down and continue attacking them while they’re down. But don’t just continuously hit the attack button, knock them down then throw a few hits. Most lesser enemies will be down in 4-5 attacks. If they survive, back off and use a jutsu to finish them off. By learning the timing of the knockdown mechanic you can essentially take out an enemy while they’re on the ground, or at least deal some extra damage.